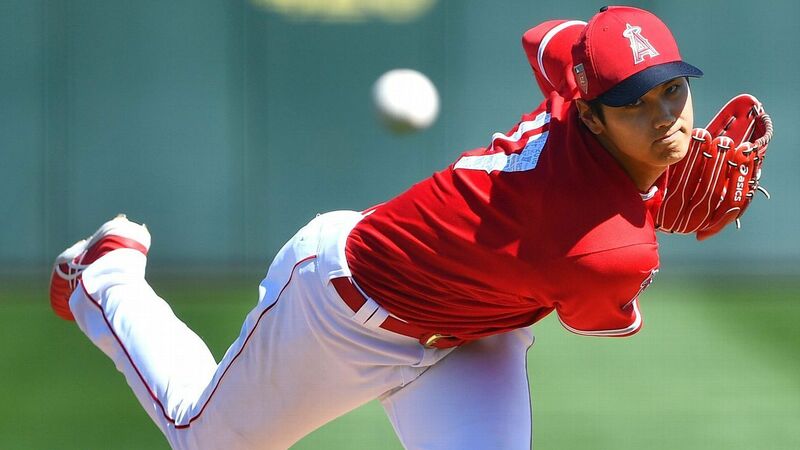 Despite a rocky spring on the mound, two-way phenom Shohei Ohtani will make his pitching debut for the Los Angeles Angels on Sunday against the Athletics, manager Mike Scioscia said Tuesday night. Ohtani's debut will come in the finale of the Angels' season-opening four-game series in Oakland. He will follow Garrett Richards, Tyler Skaggs and Matt Shoemaker in the rotation. "We could have shuffled things in a lot of different ways," Scioscia said of the rotation. "This makes the most sense for where we are right now. We'll adjust as we have to as we move through the season." Scioscia said he could insert Ohtani into the Angels' lineup before Sunday, most likely as the designated hitter. Ohtani struggled both as a hitter and as a pitcher this spring, raising questions about whether he would begin the season with the Angels or in the minor leagues. In two Cactus League starts, he compiled a 27.00 ERA, allowing nine hits and nine runs in just 2⅔ innings. At the plate, he went 4-for-32 with three walks and 10 strikeouts. In Ohtani's final tuneup before the regular season, against minor league hitters on Saturday in Arizona, his fastball command was off, resulting in five walks, a hit batter and two wild pitches. Still, Scioscia called it a "great outing." "There were some things he was working on, he's trying to nail down," Scioscia said after Saturday's game. "When it's in sync, [his fastball] comes out hot. Early on, it was somewhat erratic. He's working on some things. He'll be fine." Ohtani was asked if he wished he had faced more major league hitters this spring after coming over from Japan during the winter. "Of course, in a perfect world, I would've like to have faced more major league hitters, but it's more than that," he said Saturday through his interpreter. "It's also about me making adjustments with the mound and the ball and all that. It didn't really matter who I faced. I just had to check with my own stuff, mechanics [and] timing."